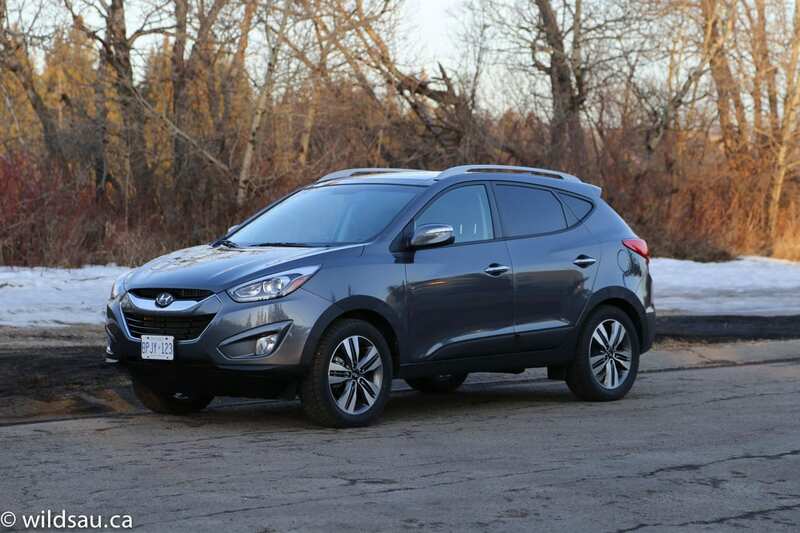 The Hyundai Tucson, now a couple of generations in, is a contender in a highly competitive compact crossover class. While we got to meet this one a few years ago now, it has received a few updates to keep it current. Unfortunately many crossovers, including some of the little guys like the Tucson, still have design cues that are influenced by their SUV past. And that’s not always a good thing. 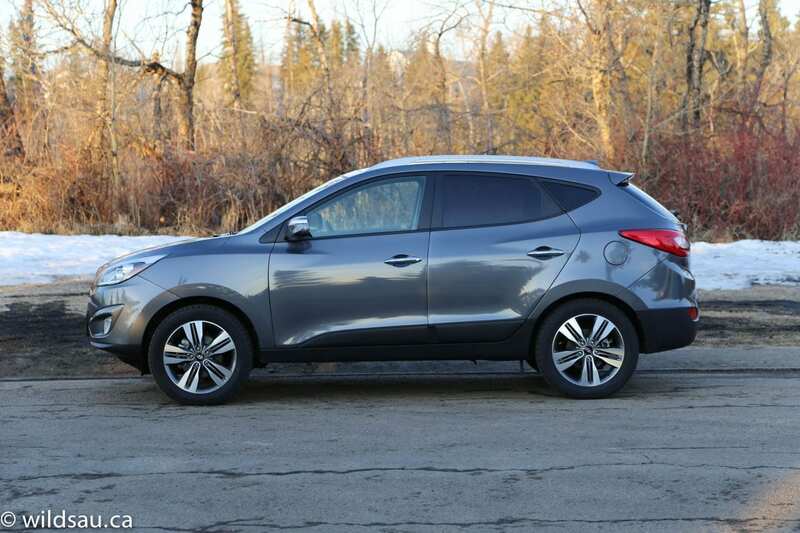 Hyundai was able to look forward instead of back, and thankfully the Tucson’s lines are more modern, curvaceous and decidedly un-SUV-like. 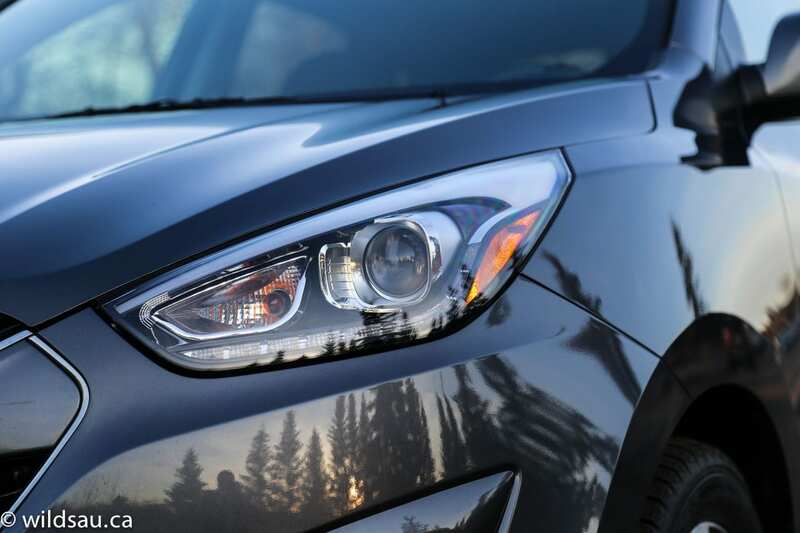 Hyundai uses the term “fluidic sculpture” to describe their current design language, which sounds silly to me, but it has worked for most of their models. 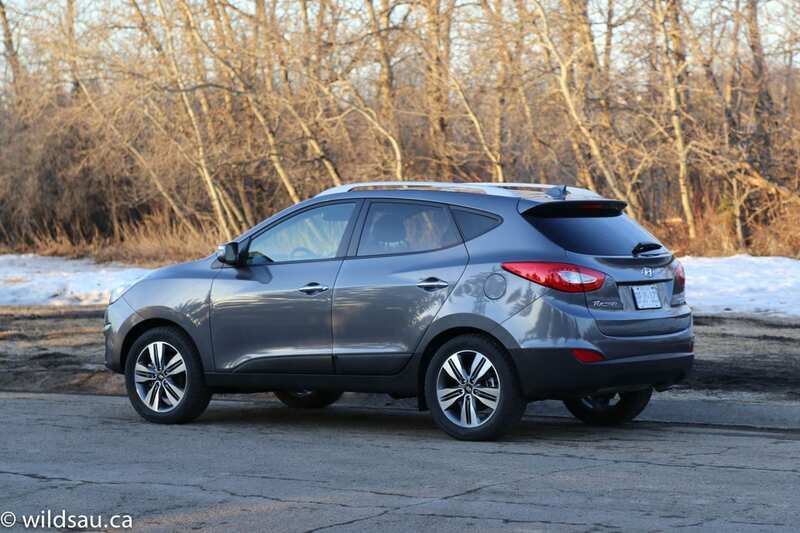 The Tucson was actually the first model to benefit from this sleek new styling direction. As a matter of fact, I’m not sure you’ll find a straight line anywhere. It embraces its curves and for the most part, it is able to pull it off, looking downright luxurious from some angles. I think it gets a bit chunky toward the rear, visually speaking, but it’s a handsome design and has a nice silhouette. The front fascia benefits from LED running lights and expensive looking headlights – the expressive wrap-around tail lights are LED as well. 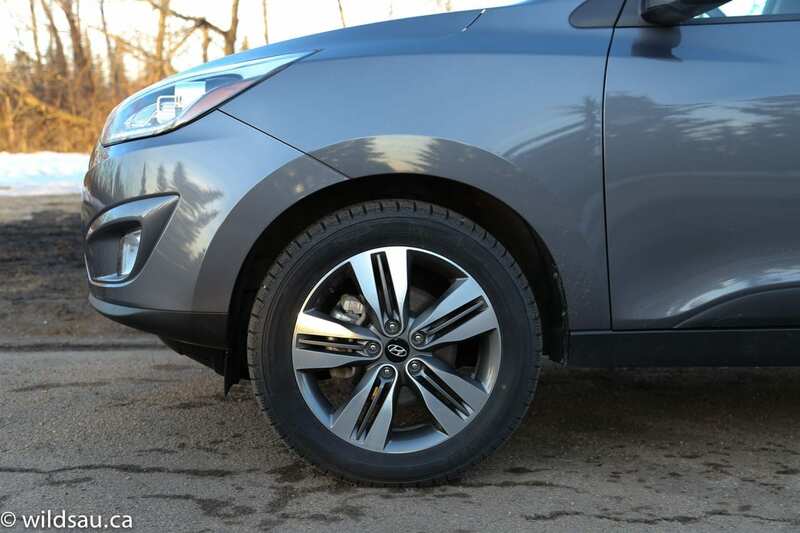 18-inch wheels look good, and are wrapped with 225/55-sized tires. The cabin isn’t huge, but never felt crowded to me – headroom is fine for my frame. The entire dash is made of hard plastics and I’m pretty sure it’s not a class leader in terms of fit and finish, but things are very nicely textured, making it easy to look at. The styling, while basic, is still a stand-out compared to much of the competition – it just works and looks nice while doing so. 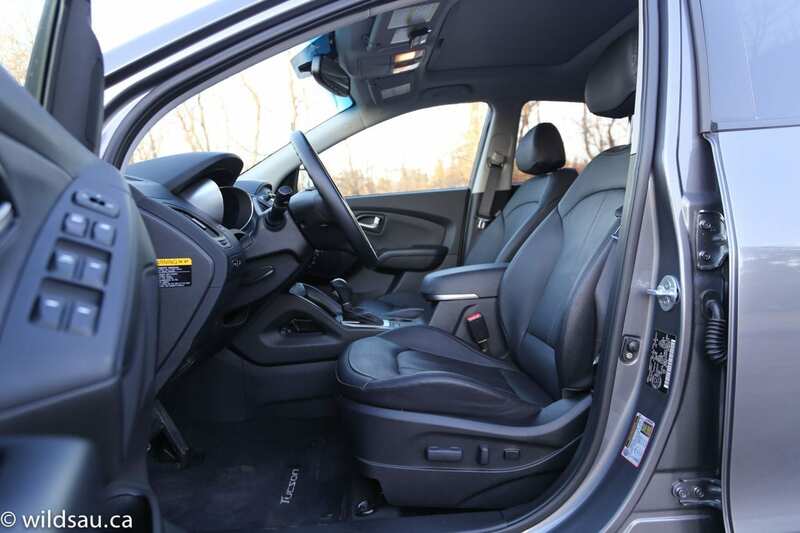 The very comfortable heated leather seats (power adjustable for the driver) are also nice to look at and provide reasonable support. I enjoyed the steering wheel – it’s nicely wrapped with leather and perfectly grippy. The instrument bin has two easy-to-read gauges with a useful, crisp 4.2-inch driver information screen between them. The centre of the dash has a relatively sharp, easy to read 7-inch touchscreen – it handles your navigation, media and phone functions. I found that it’s a bit of a reach for me, but the distance is acceptable. 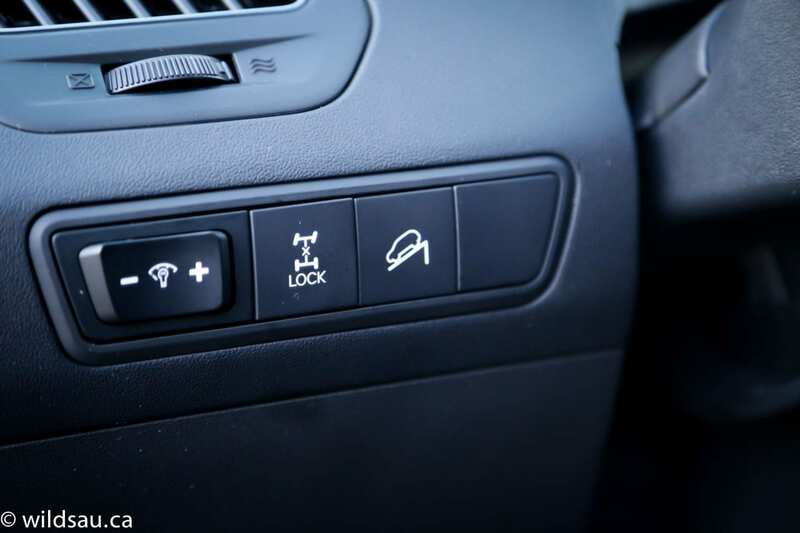 Below that is a dual-zone automatic climate control system. Some nice touches: automatic projector headlights, a rear-view camera, a tilt/slide sunroof overhead and HomeLink universal garage door openers and the audio system sounds good. The back has three seats of course, each with a seatbelt and headrest. This trim makes the two outboard seats heated, and they’re relatively comfortable although I found the seat cushions a tad short. There is good leg room and decent head room for me at 5’10” – taller passengers will find head room acceptable but not spacious. The seats recline, allowing you to find a nice position. 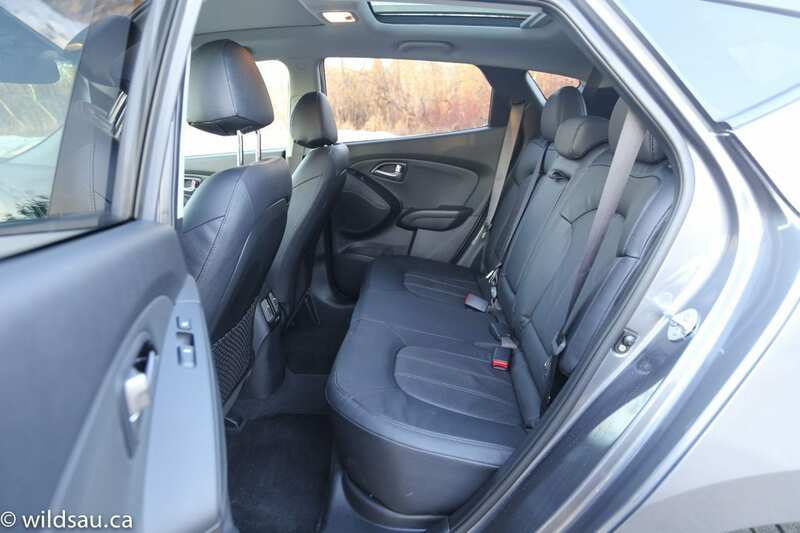 The rear passengers get adjustable air vents, a middle seatback that folds down into an armrest with two cupholders and a lovely separate moonroof for the back with a sliding sunshade – which makes things nice and bright. Our three kids were pretty comfortable back there, but width-wise it turned into a bit of a squeeze. There are two sets of LATCH anchors for children’s seats. There are enough places to put your stuff around the Tucson’s cabin. 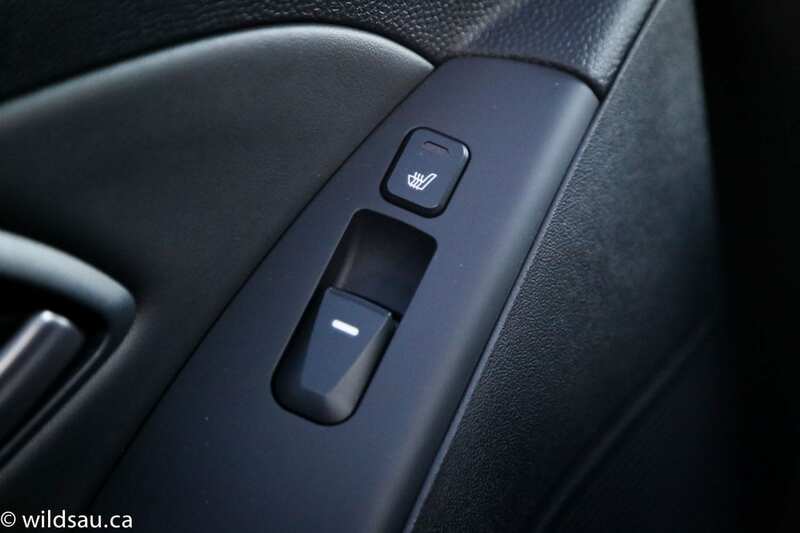 I liked the inset “dish” I found at the front of the centre console – with two 12V plugs as well as the auxiliary and USB connections , it was a great place to drop my phone or media device. You’ll also find a little carpeted storage bin under the upholstered armrest. 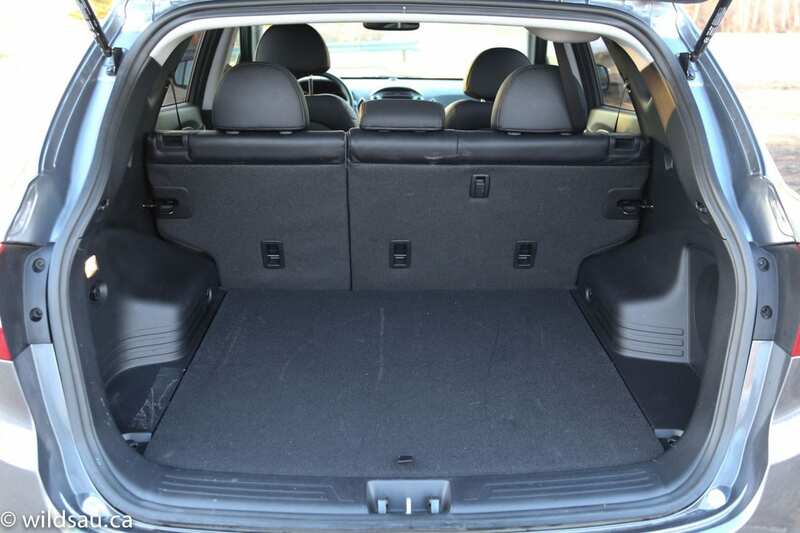 The trunk is quite large, offering 728 litres of space behind the second row of seats. Fold them down, and that grows to 1580 litres, which is enough to get most things done. 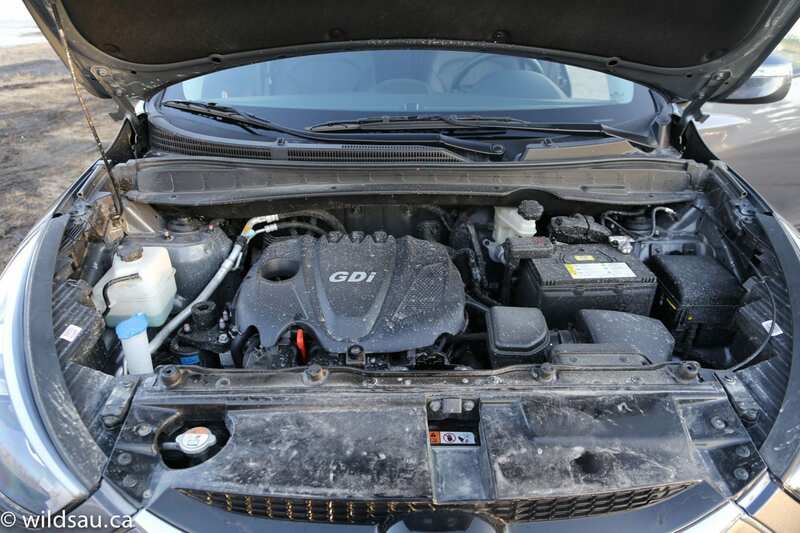 The Tucson line comes with a couple of direct injection 4-cylinder engines – this Limited trim one has the bigger 2.4-litre unit. 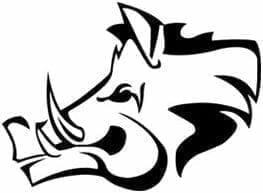 It puts out a healthy 182 horsepower at 6000 RPM, and 177 lb.ft of torque at 4000 RPM. 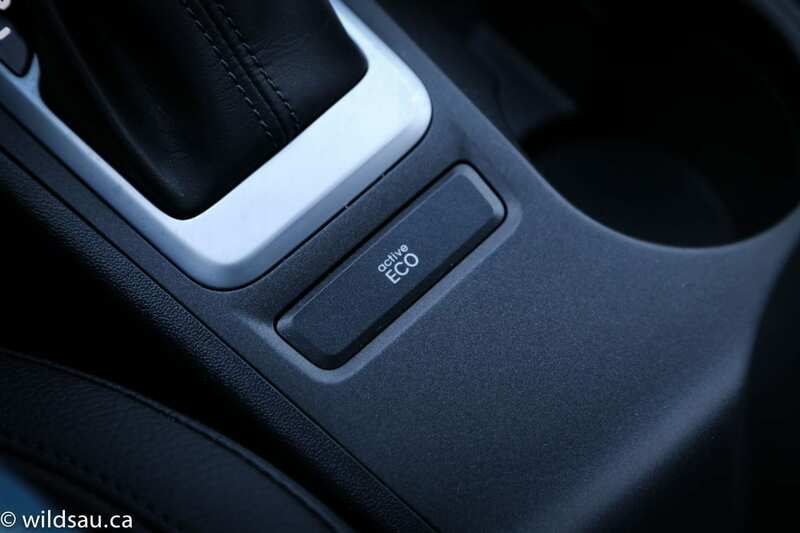 Power makes its way through a 6-speed automatic transmission to an all-wheel drive system. Fuel economy ratings aren’t stellar, and it’s a bit behind the competition. This doesn’t come as a complete surprise, since the vehicle is not a light weight – it tips the scales at 3439 pounds. 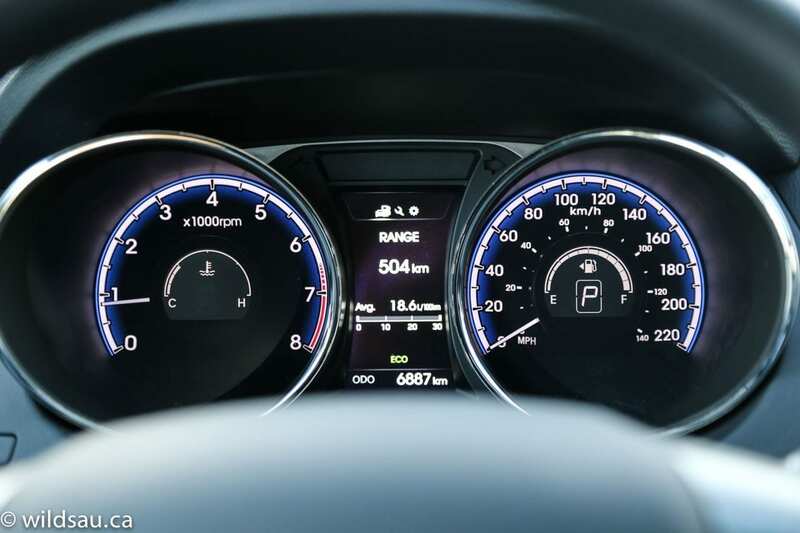 The Tucson is rated at 10.2 L/100 km (23 US mpg) in the city and 7.8 L/100 km (30 US mpg) on the highway. I averaged 11 L/100 km (21 US mpg), while trying to drive somewhat economically. It has a 58 litre fuel tank. The Tucson’s 4-cylinder provides a good amount of power. It’s snappy off the line, and has plenty of jam for any normal driving situation. If you’re on the highway and trying to pass, it could benefit from a little more power, but it’s certainly more than adequate – especially for this class. Tucson has an Active Eco mode which I ended up driving in for the majority of my week with it. It does make the throttle response a bit more sluggish, but is very drivable. 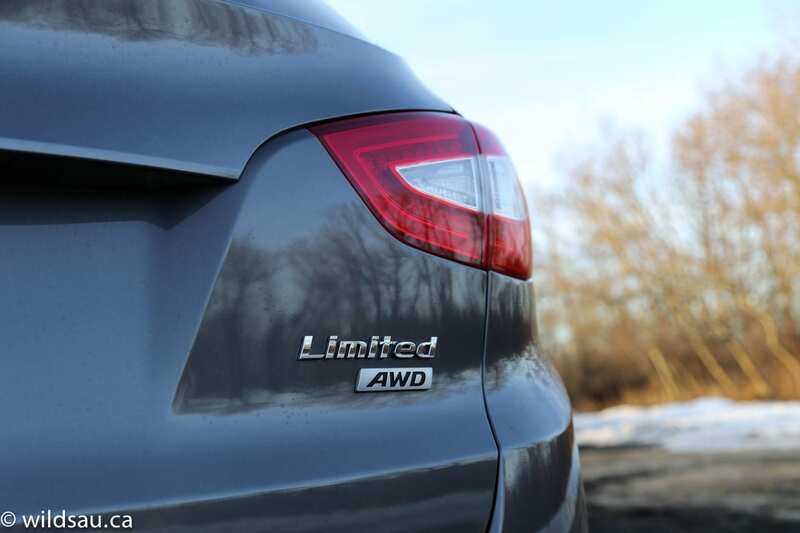 The Hyundai transmission is super-smooth at all times, but not particularly fast. It takes a second or two to drop down to the appropriate gear which is perfectly fine. 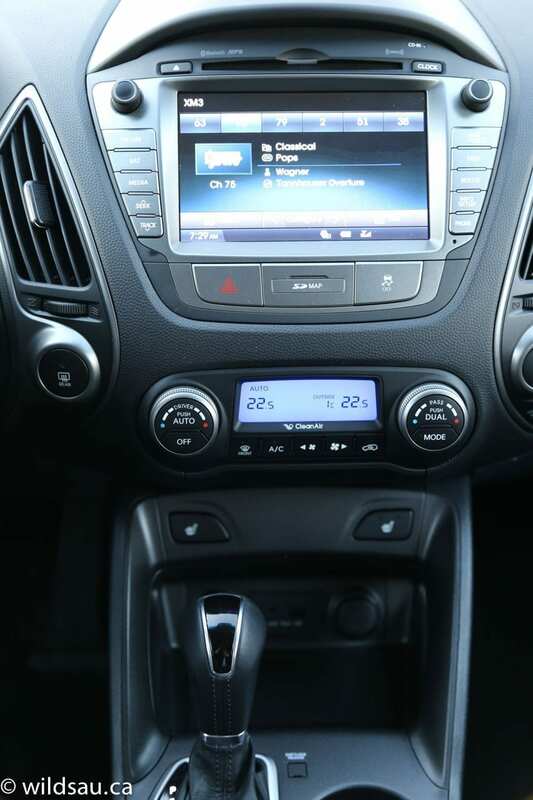 The Tucson’s gears can be changed manually – these changes aren’t crisp, but certainly quick enough and buttery smooth. I found the ride to be firm but good – it was mostly comfortable, however bigger road imperfections caused the suspension to get a bit crashy at times. 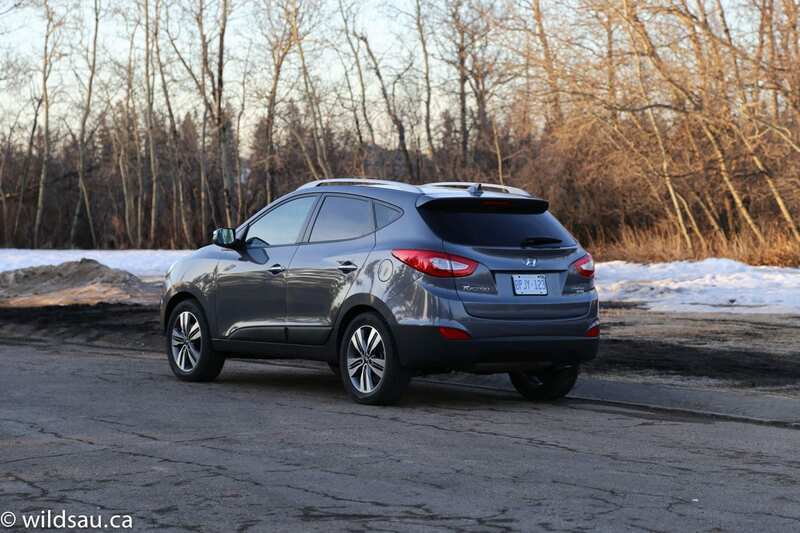 The vehicle’s handling is OK and agile enough for a compact crossover. It is definitely a taller vehicle, and it doesn’t hide its top heaviness as it leans around corners, but this wasn’t anything unusual for a smaller crossover. In the end, I found it to be a nice balance between ride quality and driving dynamics. As I’ve come to expect from most Hyundais (and Kias), the steering is a bit numb and uncommunicative. You get the standard Hyundai 3-position adjustable (Comfort, Normal, Sport) steering effort, which doesn’t add any road feel whatsoever. The Tucson has a nice high driving position with a good view of the road – as a matter of fact, visibility out of the Tucson is good in all directions. The all-wheel drive system was completely transparent to me, as I was on dry roads and solid surfaces the whole time. Noise levels are variable – engine noise is very muted, although it’s there, but road noise is quite evident at times. I did catch wind noise at freeway speeds – again, nothing unexpected for a taller vehicle like this. I have to speak out for the voice recognition system – it did exemplary work, never failing me and always getting it right on the first try. 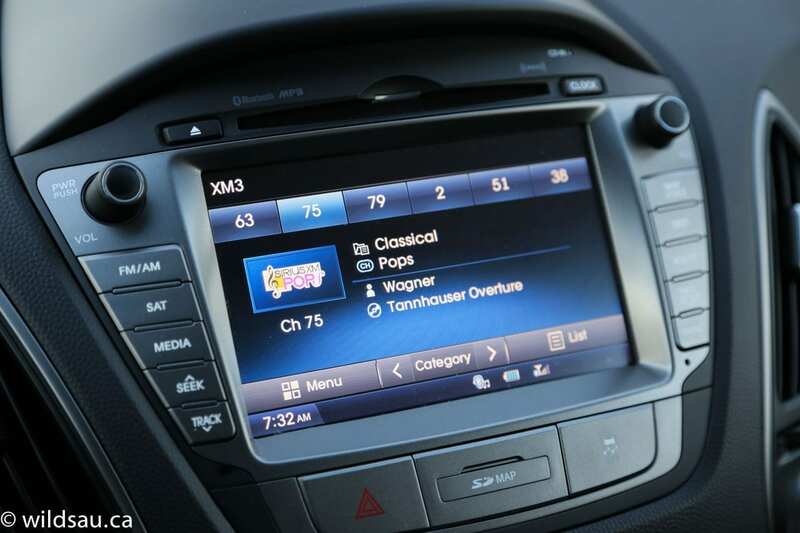 I hated that I had to hit the “OK” button on the touchscreen every time I drove the car, acknowledging my understanding of all the horrible things that could happen if I were to use the screen while I’m driving. There’s nothing wrong with flashing the warning on the screen, but it should go away on its own after a few seconds. Don’t you trust us, Hyundai? Overall, the Tucson offers a nice balance of attractive design, functional and spacious enough interior, reasonable level of technology and is quite nice to drive. 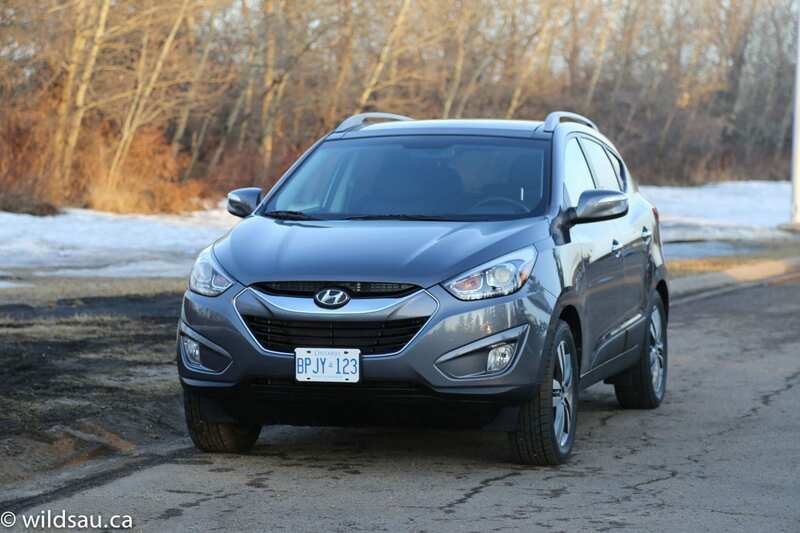 I give the Hyundai Tucson a 7 out of 10. WAF (Wife Acceptance Factor) was high. 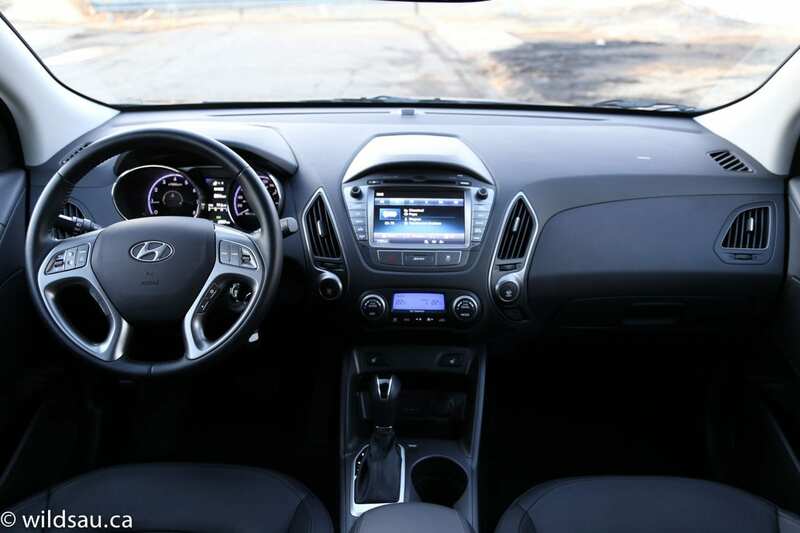 She really enjoyed the high driving position, and found the Tucson easy to park and drive. She said it felt like a more expensive vehicle than it really is – something I agree with for the most part. This class is a killer – highly-competitive, and sells like hot cakes. 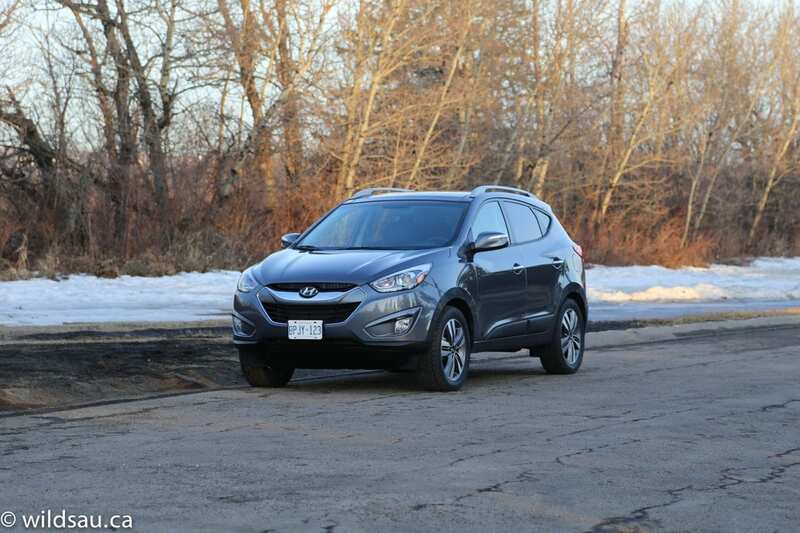 Hyundai has a fighter in the Tucson, even if it’s a few years old. It can hold its head up high, and it will continue to find happy buyers.